Global Press Release: Wiggly Loaf Shop is now open. If your world needs more peace, love, empathy, and understanding, Wiggly Loaf is for you. Wiggly Loaf understands, and is there to help you feel better about yourself. Wiggly Loaf wants you to know you’re not alone, and we are all in this together. Wiggly Loaf just wants to protect you from all the things you fear, and always be there for you when you need a helping hand. In short, Wiggly Loaf wants to be your friend. Wiggly Loaf can focus in on all the love that’s out there in the universe trying to find you, and Wiggly Loaf will help you draw it into your life. If your life needs any of these things, then you might need Wiggly Loaf. 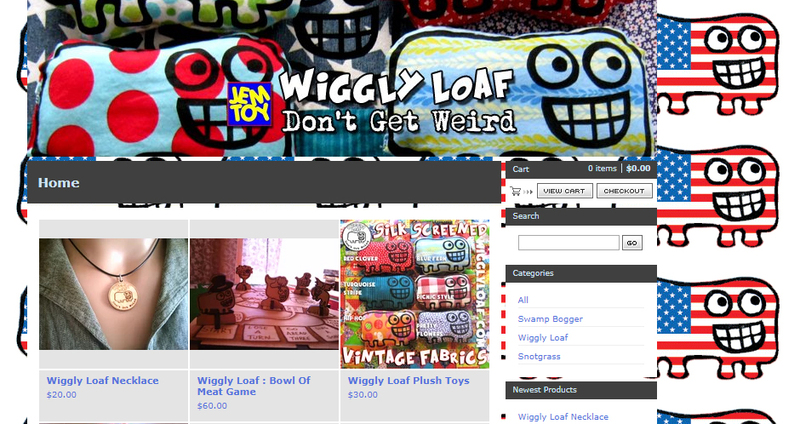 We’ve got hand silk screened vintage fabric Wiggly Loaf plush toys, Classic Wiggly Loaf Don’t Get Weird Pendants, and the super fantastic ultra deluxe Wiggly Loaf Bowl Of Meat Game. I know, it’s hard to hold back so much excitement, but it’s true. Everything is hand made in Maine by J.E.Moores of JEMTOY.com ~ quantities are limited, order now so you don’t miss out. Let loose the magic and comfort Wiggly Loaf will bring into your life. Don’t get weird, get Wiggly! Click below to see the stuff, and thank you!! !